The past couple months I’ve enjoyed spending time on Hillhurst Avenue. It’s a low-key neighborhood-type street with a fair amount of eating choices, particularly during the day. Click to read more about Hillhurst Avenue. One day while walking down Hillhurst Avenue in Los Feliz (Los Angeles), I was mesmerized by Community‘s atmosphere and promise. For several reasons I wanted to try this restaurant and perhaps even become a frequent customer. Community left many promises unfulfilled. Its location on Hillhurst Avenue is very good for a neighborhood lunch place. Community has a warm, cozy and welcoming atmosphere. My Community Noodle dish, however, tasted like boiled cabbage and onions. The service was satisfactory. I did not feel that my dish was worth the high price charged for a soup featuring such inexpensive ingredients. I would not recommend going here unless you wanted to try one of its signature dishes. There are many other options on Hillhurst Avenue in Los Feliz. First, the name itself suggests that you can become part of a community by eating here. It made me think about the television series Cheers. Perhaps I might become a regular here, a place where people would know my name. Corny, right? Second, the woodsy cozy atmosphere makes you feel at home from the moment you walk through the door. Wood tables, bookshelves lined with cookbooks and other memorabilia, and the general vibe inside the restaurant welcome you and somehow invite you to stay for food or drink. The single dining room inside seats twenty-four persons around three communal tables (two designed for six, and one designed for eight) and two smaller tables for two persons each. Outside in front of Community four stools can accommodate more persons below a make-shift counter. I love sitting at wood communal tables to eat, drink and write. Immediately I imagined coming to Community during meals or even during off-hours for dining and work. Third, from first glance the menu offered several food options that could qualify as comfort food. Their fried chicken, Mac and Cheese, and soup caught my attention. Although I’m currently trying to watch my weight, I might be tempted to make an exception for such yummy-looking features. Fourth, the woman who greeted me the first time I entered Community had such a beautiful smile and friendly disposition. In the nicest voice she informed me they were closing for the day and invited me to come back another time. I was hooked. Definitely I would come back. The promise of a restaurant where I would feel at home, could eat and write, and be served by such a friendly person encouraged me to return. How did Community Match its Promise? When I went back to Community on April 11th, I was overall disappointed. I arrived at noon, a bit early perhaps for lunch. Still surprisingly I was the only customer in the restaurant. During my lunch a couple walked in to eat. In the hour I dined, no one else came in. I wondered if I picked a slow day to try Community. However, when I left Community I noticed that other eating establishments nearby were busy with customers. Most dishes on Community’s menu feature meat or fish, making it hard for vegan diners. Even though I do eat meat, I try to eat vegan at least two meals a day. Click to read more about my diet. I found the dietary symbols that Community used on its menu to be very confusing. For example, where most restaurants use the abbreviation GF to indicate if a dish is gluten-free, Community uses F. Equally odd, they use N for vegan dishes instead of the customary Vg or V+ symbols. 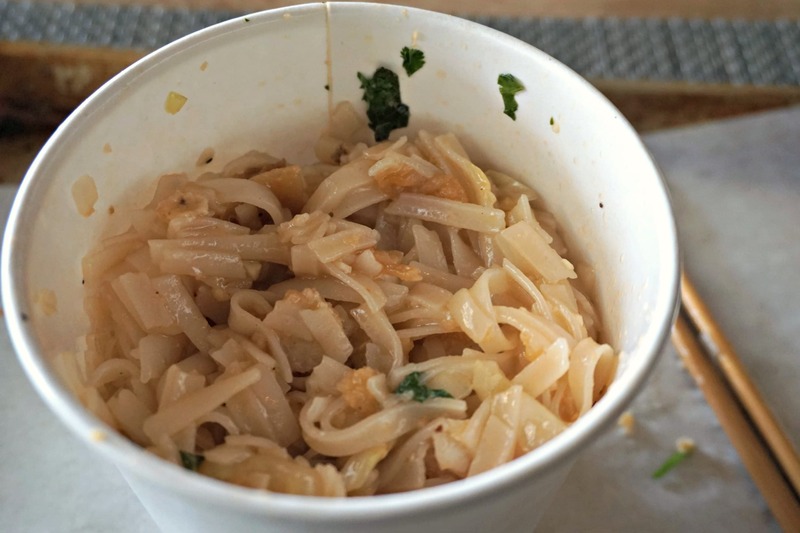 With very few dishes on the menu described as either vegetarian or vegan, I selected the Community Noodles, which was indicated as gluten-free (rice noodles) and vegan. 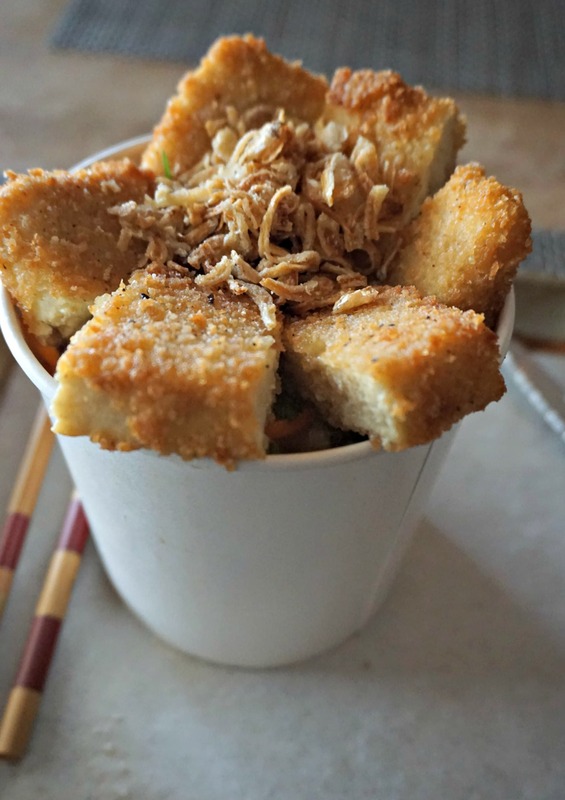 However, customers may order a supplement of pork, beef, fish or tofu on top. I ordered it with a tofu topping to supplement the promised bok choy, Chinese cabbage and daikon radish, among some other vegetables. Noodle soups are one of my favorite dishes. Almost nothing matches The soul-fulfilling nourishment given by hot flavorful noodle soups, such as ramen, Pho or even chicken noodle soup. Imagine my disappointment then when I received a large carton cup of hot noodles with six cubes of tofu and a low amount of vegetable broth. The soup’s presentation was quite pretty when viewed from the top. After eating the tofu on top, however, I was left with so many noodles. The taste was off-putting, as if they boiled the Chinese cabbage, shallots and bok choy and then added some noodles and tofu. It smelled and tasted like boiled cabbage and onions! No way was I able to finish my cup of soup, which was far smaller than I would have expected. Almost never do I leave food on my plate, so you can understand my displeasure. Community could have easily improved this soup. For example, by adding more greens, such as raw or braised spinach, mushrooms, carrots, or other items to enhance its flavor and color. A little garlic, red chili flakes and/or miso would have also helped to improve the taste and depth of this soup. To be fair to Community, I probably made a bad choice. 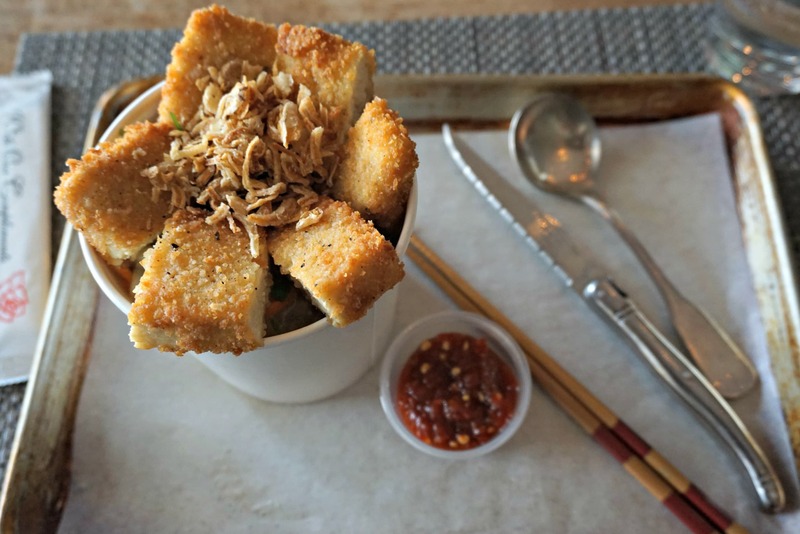 Community’s signature dishes seem to be Mac and Cheese, fried chicken, lamb and potatoes. I should have perhaps ordered to their strengths. Yet, why put a dish so stinky on your menu? Why make it sound like a house dish by adding Community to its name? For lunch a young gentleman served me. He was perfectly satisfactory and courteous, yet not as friendly and warm as the woman I had met on my maiden visit. When he took away my half-eaten soup, he asked if I wanted a dessert instead of inquiring why I had not finished my dish. He was not tuned to my facial or other reactions. A more experienced server might have picked up on my cues. I’ve already described above my thoughts on the quality of the Community Noodles. For this unpleasant dish, I would not want to pay anything. Imagine then my thoughts when I paid $14.00 for a carton cup of soup and an additional $5.00 for the small tofu supplement. When I’m dining in a restaurant, not a fast-food establishment, I do not want to be served on carton dishes. A hot bowl of soup should be presented in an attractive porcelain, clay or other hard-material bowl. I was a bit concerned that the carton cup would not hold the soup and the hot liquid would fall on me. Why serve this soup in a carton cup? The ingredients used, mainly rice noodles with some added shallots and cabbage, are very inexpensive. For the price paid for this dish, Community should add some better quality and more flavorful ingredients. Compared to hearty ramen or pho soups I can eat for less money at other establishments in Los Angeles, Community Noodles rates a very low score. If Community charges $5.00 for a tofu supplement, it should give a more generous serving. At Stamp Proper Foods up the street, I receive a hearty supplemental portion of tofu for the same price. Given Community’s name and its homey, natural atmosphere, I expected there to be a social responsible emphasis on locally-sourced and organic ingredients. Sadly there was not a mention of organic on the menu. Had Community used organic, locally-sourced ingredients, I might have understood better charging slightly higher prices. In short, I do not think the quality of my Community Noodles dish was worth the relatively high price charged. If I had ordered one of Community’s signature dishes, I might have had a different appreciation. Yet, given my experience, I am not encouraged to return to Community to give them a second chance. A couple additional comments might be useful to some customers. First, to use Community’s restroom, customers have to go out the front door and go around the building to the back alleyway to enter a small toilet off of the kitchen. As I was still excited about the promise of Community I did not mind so much going around to the back. I do not think though I would appreciate doing this every time. Nor would I recommend other customers to do the same. Fortunately, Los Angeles’ weather is wonderful most of the time so customers wouldn’t ordinarily get drenched by rain as they go outside. Second, there is no WiFi at Community. The absence of WiFi might not matter to most readers. I usually don’t care if there is WiFi available at a restaurant when I’m dining. However, I considered Community as a possible place where I might eat and work. I imagined spending a couple hours in the afternoon writing on my blog, which is not possible without WiFi. Please read my review above and share with your friends using the social media links. Click to find other reviews on Los Angeles restaurants. More reviews will be coming so visit again. 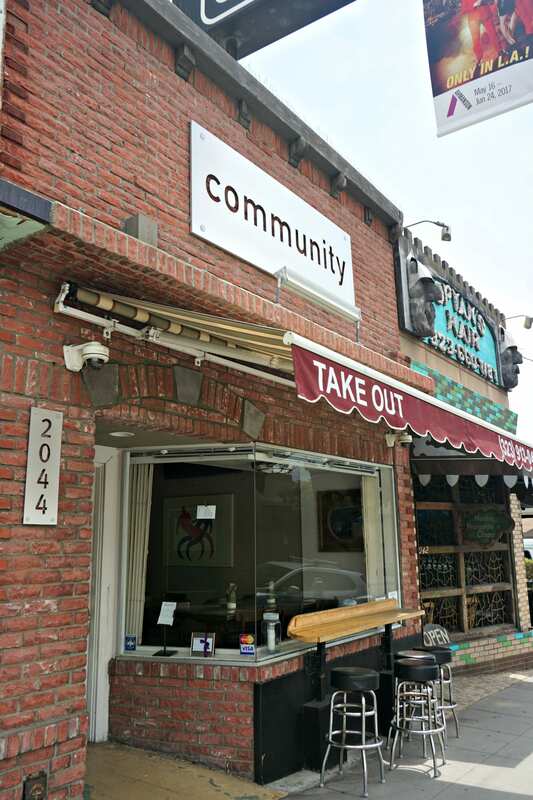 Well, I am curious as to why it was named Community, was it simply a catchy name for a commercial establishment or was it like one of those restaurants that helps out people who need jobs in a work program for some Social Service agency or even a church agnecy. If the tofu alone was $5, that’s too much! Sorry the Noodle Soup was a bust, clearly they don’t serve vegan–which not all restaurants do! If you go back, and try one of their signature dishes such as the Mac and Cheese, I would be interested in your review. As far as the bathroom issue, there was a breakfast/lunch establishment in my town that was called Gold St. Cafe that had the same setup BUT it was extremely popular. In 2016, they’d been closed for over a year but last year said they would reopen under a new owner and call themselves “Trendy’s”. I haven’t eaten there but the food looks more enticing to me. They aren’t vegan/vegetarian either, but they of course serve oatmeal, waflles, pancakes and an egg white omelet with veggies. In a small town, you often make do if you eat out. Too bad Community didn’t meet your expectations. I am not interested anyways because of the meat-oriented venue–but thanks for alerting me! Hi Allison, I thought that given the name there would be some kind of a social responsible angle. But nothing apparently, except if you have a loyalty card you get points and rewards and thus become part of their community. With all the eating choices available in Los Feliz, I’m not sure I’d go back to Community. Thanks for your feedback. It must be harder in a smaller town to get what you want.